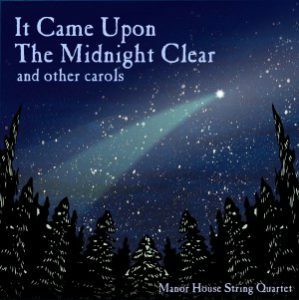 Noel Nouvelet For String Quartet – The final track on the Manor House String Quartet‘s album ‘It Came Upon The Midnight Clear and other carols’ is the¬†ancient French piece, ‘Noel Nouvelet’ (you can hear a sound sample of it by clicking on the link). Like many traditional melodies it has a complicated history that means there are a variety of sources, largely inconsistent. This in no way detracts from the majestic power of this melody which made it a fitting ending to the album. In fact it was originally a New Year’s carol which dated back to the 1500s and appeared in the 1721 ‘Great Bible of Christmas Carols’ containing 13 verses! ‘Noel Nouvelet’ is a tune which possesses great dramatic potential and this arrangement by Vaughan Jones has many virtuosic passages with a driving semiquaver accompaniment. In the second half there is a mini development section where a fragment of the main theme is passed around the instruments of the quartet before a downward chromatic sequence leads to a¬†rousing coda. All in all a fitting end to two¬†CDs spanning some 46 carols and several centuries of wonderful Christmas music!